This is a guest post contributed by Heather Coates, Digital Scholarship & Data Management Librarian at IUPUI. My perspective as a tenure-track librarian tends to be that of a practitioner-researcher. Practically speaking, this means that part of my job is to know how the scholarly ecosystem works – to understand how scholarly products are created, disseminated, used, curated, and evaluated. Over the past three years, I have taught several workshops sponsored by IUPUI’s Office of Academic Affairs on using citation metrics and altmetrics to demonstrate excellence and impact in promotion and tenure (P&T) dossiers. To date, several things have led me to some insights that I think are helpful for librarians interested in supporting use of altmetrics: developing altmetrics workshops and doing one-on-one consultations; conversations with my campus’s Associate Vice Chancellor of Academic Affairs and Director of Faculty Enhancement, and the experience of assembling my own dossier. In this post, I’ll share useful strategies for offering successful altmetrics workshops on your own campus, and advice for crafting messaging that resonates with researchers at all stages of their careers. Faculty do not typically think of the library for support in putting together their dossiers, so it is crucial to partner with units that faculty seek out for this expertise. Luckily for us, a valuable opportunity fell into our laps. In 2012, librarians were invited to work with the Office of Academic Affairs to support faculty in gathering evidence for P&T dossiers. This support began with a 2-hour workshop, which is now part of a regular series in support of faculty development. Here’s how it went. We started off in the fall of 2012 with a broad introduction to publication-based metrics. It was a fairly traditional library workshop that focused heavily on citation metrics from subject and citation databases, plus Google Scholar. However, we did describe the various levels of evidence (journal-level, article-level, and author-level) and introduce the idea that journal-level metrics are the least relevant to promotion and tenure. We also introduced ImpactStory, a researcher profile that includes altmetrics data, and sources for informal metrics like acceptance rates, library ownership counts, and indexing status. Here’s how the workshop was structured: in the first 30 minutes, we provided the explanatory content (what citations and altmetrics are, how they are sourced, and so on). The rest of the two-hour workshop was a mix of demonstrations and hands-on activities with tools like Web of Science and Google Scholar. We wrapped with a Q&A panel that included two librarians and the Vice Chancellor of Faculty Affairs. We learned two major things in the first workshop: many faculty already had Google Scholar profiles, and faculty were more interested than we assumed in altmetrics. There was enough interest expressed in the evaluations that we expanded the altmetrics section in the fall 2013 workshop. Around that time, we also began offering this workshop each fall and spring semester, rather than once a year. This allowed us to differentiate the focus of the workshops a little each time: for example, one year , we held two workshops, one for health professionals, science, and technology and another for humanities; another year, we focused on demonstrating impact in public scholarship and civic engagement, as well as for team science. Our most recent workshops (2014-2015) have focused primarily on altmetrics. We have also begun to differentiate workshops and guidance for the types of products and scholarship that faculty across campus are creating. The workshops have been so successful because we brought librarian expertise to a support system (Academic Affairs promotion & tenure workshop series) that was already established and in demand. Had we tried to host these workshops on our own, they would not have been as well-attended. The most valuable aspect of this process for me has been the collaborative relationship developed with the Office of Academic Affairs. Thanks to them, I have learned much about the promotion and tenure process at IUPUI, as well as the dynamics between campus tenure/promotion guidelines and department/school-level guidelines. In fact, my relationship with the OAA has helped pave the way for a longitudinal study examining trends in IUPUI faculty publication practices. These workshops have been a great opportunity to hear about faculty concerns and engage them in a conversation about broader issues. In the context of helping faculty to achieve their career goals, it is easier to bring up issues like open access, data sharing, choosing publication venues, and other strategic decisions they can make to increase the reach and impact of their scholarship. It became clear during the development of the first workshop that faculty do not typically make strategic decisions about disseminating their scholarship, except aiming for journals with the highest impact factors. (And we all know how well that works for faculty publishing in less cited fields and unranked journals.) This strategy should be informed by personal, departmental, and school priorities. Many early career faculty look to their department chairs for guidelines for what journals are most highly valued. When researchers follow departmental priorities without considering the specific audiences (researchers, practitioners, business or public communities) with whom they want to engage, the impact and reach of their work often suffers. This is particularly true for interdisciplinary and community-based research. Librarians should make use of our skills in navigating the ecosystem to guide faculty in making informed choices for publication venue, author rights retention, sharing, and targeted outreach to the key stakeholders for their scholarly products. Over time, the altmetrics component of the workshop grew based on feedback from faculty and the dialog with Gail and Mary. We also began to offer differentiated workshops based on the types of P&T case (e.g., research, service, teaching, balanced case) as well as the discipline. Though librarians have expertise in the scholarly ecosystem and bibliometrics, we are not necessarily well-informed about the P&T standards and procedures at our own institutions. Those of us who have been involved in developing and providing these workshops have learned an immense amount about how this evidence can support a candidate’s case, as well as the need to present it as part of a cohesive narrative that is easy for the reviewers to read and evaluate. In particular, I was surprised by the weight placed on the candidate’s presentation of their evidence. Even with very strong metrics, a candidate must present them in the appropriate context and connect them explicitly to their case in order for reviewers to give them weight. The Becker Model from Washington University provides a useful framework for putting metrics into context so that reviewers can evaluate them appropriately in the context of the candidate’s argument. This model also helps faculty to connect particular products and available metrics to particular types of impact. My advice for building these collaborative relationships with units like Academic Affairs is to go slowly and focus on developing a constructive dialog. Like the library, they exist to support faculty. Building a network of support in which faculty can succeed is a major driver for this collaboration. It also helps to counter the perception that libraries exist only to circulate books. Advocating for the use of broader metrics for impact and reputation in P&T requires engaging with faculty, departmental administration, and campus administration to make change on campus. While “change” was not necessarily a goal when we started offering these workshops, guerilla advocacy has become a part of my conversations with faculty. One advocacy tactic is to help researchers step back to see the value of all their scholarly products in new ways. One easy way to get them to think outside the box is to have them list all of the products resulting from one specific research project. This usually includes presentations, posters, white papers, policy reports. Sometimes faculty list code, models, data, and teaching materials, depending on their focus. With these specific products in mind, describe a couple of scenarios for how altmetrics provide data for individual items. This really helps them to understand the power of altmetrics. Rather than relying on a general metric describing the impact of the container for their work (i.e., the journal), they can point to specific evidence for how their presentation or blog post or syllabus has been discussed and reused. This type of evidence is also more powerful for supporting a case because it relates directly to the items produced during the period of review. The promotion and tenure process is about demonstrating potential for contributing to scholarly knowledge in your discipline, but that’s difficult to do in the relatively brief window that faculty have to publish before they go up for tenure. Given the lag in accumulating citations, a great way to get buy in for altmetrics is to help faculty understand the portfolio of metrics that they can use to demonstrate the impact of their work in multiple areas, more quickly than citations. My goal as a librarian in this area is to advocate for more sustainable practices through informed decision making. If you care about these issues, become a local champion for open access or data sharing or open science at your institution. You can also raise awareness through service on campus committees, getting involved with new faculty orientation, and engaging department chairs in discussion of their priorities and criteria. As a champion, the most important step is to become an adopter – use altmetrics in your own promotion and tenure materials and discuss their value with the library promotion and tenure committee. There’s no better way to be an effective instructor than to know that topic firsthand. So, you should become a user of altmetrics before you offer a workshop on them. 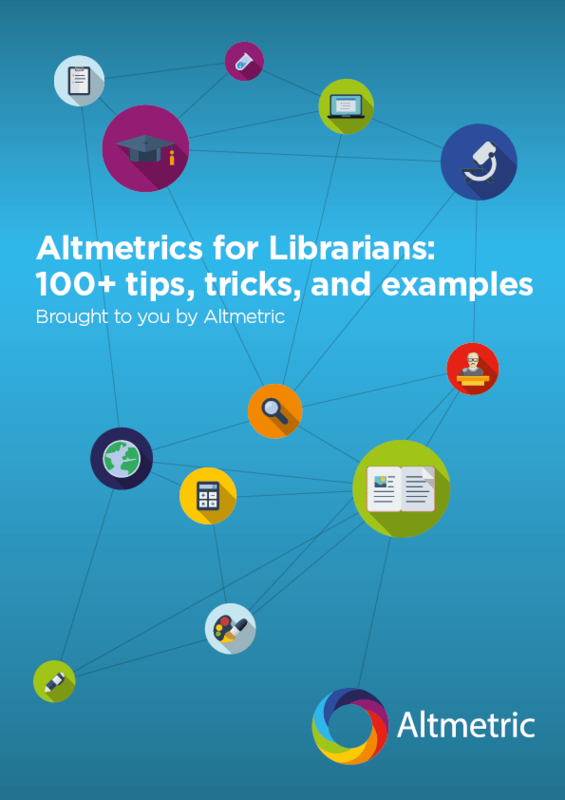 Try to use altmetrics for your own professional advancement (annual reviews, promotion & tenure, grant applications, etc)–in doing so, you’ll very quickly learn the best places to find altmetrics data, which data types are the most useful to demonstrate particular flavors of impact, and so on. As a practitioner first, I am usually my own guinea pig for the strategies and tools I recommend in our workshops. I do my best to walk the talk, so to speak. In my mid-tenure review, I included a table of webometrics (pageviews and downloads) for my materials in IUPUI’s institutional repository and on Slideshare, plus a few tweets related to my conference presentations. In my last annual review, I included a screenshot of my ImpactStory profile, Storify conversations about my conference presentations, and an extensive table of metrics for materials on Slideshare. My dossier is due in May 2016. My case will be based strongly on my engagement with and contribution to data librarianship as demonstrated by altmetrics, at least primarily. I am fairly confident that the reviewers will see the value of this evidence, at least at my own institution. Since preparing for my mid-tenure review (where I collected most of my impact data manually), aggregation tools like ImpactStory, the Altmetric bookmarklet, Google Scholar, and PlumX (if your institution has a subscription) have made gathering impact data much, much simpler. These services collect data from across the web and incorporate it into a single, article-level or researcher-level report – give them a go for yourself! These readings contain great content (including strategies for using altmetrics and examples of researchers who have used altmetrics for grants and tenure) that you can borrow from when creating workshops.